The Botswana ministry of environment, wildlife and tourism’s failure to crack down on illicit fishing operations in the wetlands of Ngamiland and the Chobe region may result in extinction of species, economic losses, and destruction of livelihoods in the northwest of the country. Information gathered by the Oxpeckers Centre for Investigative Environmental Journalism suggests that the influx of Congolese and Zambian fishermen at Lake Ngami has left authorities worried about the depletion of resources and environmental challenges that arise at the fishermen’s informal settlements. Lake Ngami falls at the southwest fork of the Okavango Delta and mostly feeds from the inflows of the delta. The Okavango, one of the largest bodies of inland water, was recently listed under the Ramsar wetlands of global importance by the United Nations. Along the lake’s shores, fishermen can be seen drying fish and packing it in large consignments ready to be trucked into Zambia and the Democratic Republic of Congo (DRC). A few years ago there were less than 200 fishermen from other countries, but the numbers have exploded to more than 3 000. Ngami farming communities have appealed to the ministry to suspend fishing at the lake because of a proliferation of squatter camps and the uncontrolled influx of pirate fishermen attracted to Botswana by the booming fishing opportunity on the lake. Bareetsi Bogaisang, chairperson of the Lake Ngami Fishing Cluster, said the problem had escalated beyond control. There was a high demand for bream and barbel in Zambia because these species had been overfished in that country, he said. “The Zambians now come to Botswana and fish in bulk,” said Bogaisang. “Some even put in orders for 30?000 to 45 000 fish a month – a figure that has increased from about 7 000 a couple of years ago. “The rising demand has caught us unprepared. This explains the failure to monitor, regulate and protect the trade from this exploitation,” Bogaisang said. 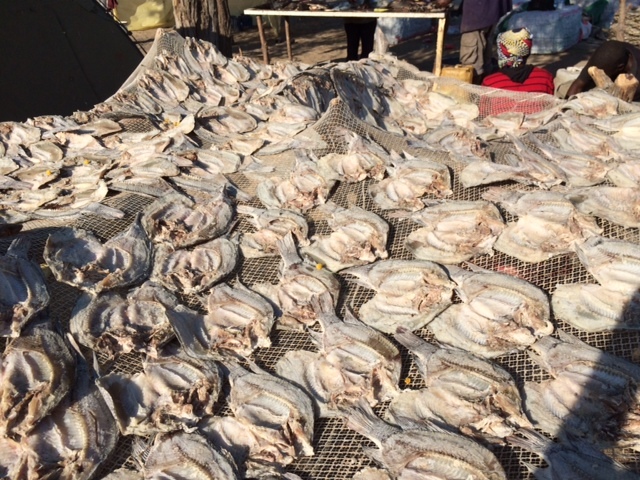 The influx of Zambian fishermen has brought with it the failure to control the market prices because desperate individuals were often outbargained and sold their fish for one pula (R1.20) or P2 (R2.40) when the cluster’s agreed pricing was a minimum of P4 (R4.80) a fish. Bogaisang said the area was being polluted because there were no cleaning facilities and rotting fish intestines clogged the water. A few years ago the department of fisheries fell under the ministry of agriculture. It has since been moved to the ministry of environment, wildlife and tourism, but the guiding policies for dealing with fishing have not yet been revised. Bogaisang said the new ministry was more concerned about conservation and tourism than about fishing for food and trade. Domestic animals that feed from the lake are also a source of conflict. Some farmers’ cattle have been rejected by the Botswana Meat Commission after detection of diseases caused by feeding from the polluted wetland area, said Bogaisang. Bogaisang said the farmers were pushing the department of environmental affairs to put measures in place for ecofriendly use of the site, but were still waiting for recourse. In January the ministry banned a number of animal exports, including hunting trophies, but fishing was not included. There is an ongoing attempt to review existing legislation that is proving to be too outdated to combat illegal fishing. An official at the department of environmental affairs, Dr Michael Flyman, said there had been growing concern about the mushrooming of illegal fishermen who exported fish without proper permits to the DRC, Zambia and other neighbouring countries. He said a management plan to involve local residents in the sustainable use of all resources in the area was in the pipeline. Flyman could not say when the plan would be implemented. It appears the Botswana government is treading carefully for fear of fuelling cross-border conflict between the main players in the fishery sector and pirate fishermen. This conflict is based on accusations and counteraccusations of overexploiting fish stocks, underpricing and illegal exports in the Ngami area. Last year the government temporarily banned foreigners from fishing, reserving both recreational and subsistence fishing for Botswana citizens. Foreigners could fish only through a licensed fishing camp or lodge. This move was criticised by locals because it was regarded as not good for business, restricting income generation in the poverty-stricken district.